This is Inn on the Harbor in the idyllic Maine fishing village of Stonington. Built on a pier foundation, this is a true waterfront property where the tide rises beneath your feet. The property is comprised of four buildings, New England style clapboard on the village side and shingle style on the water side. There are 13 very spacious rooms with comfortable seating areas and private baths. 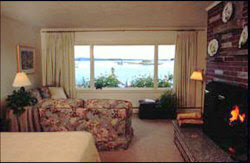 10 of the rooms either have water views from their picture windows or from their private decks. The inn has a very large (2,500 sf) common deck for all guests to enjoy, whether during breakfast or lounging in the sun all afternoon if they choose. and THIS is the view...Stonington's harbor is one of the most picturesque, working fishing villages on the coast of Maine. The shops, restaurants, art galleries and businesses line the harbor. The only time you need your car is to venture out and explore the rest of the island. Rooms are beautifully decorated in a mix of Maine cottage with a nautical accent, blending seamlessly into the surroundings. No froo-froo, just simple, comfortable and very well thought out. Some have wood burning fireplaces, all have overstuffed seating to enjoy the view, the quiet or a much needed nap. One of the things that makes this an easy to operate inn is the limited common space - just the breakfast room (which is also the espresso bar open to the public during certain hours) which opens up onto the deck. What this means to the innkeeper is that the interaction with guests flows easily in a centrally located area enabling the innkeeper to be available for guests and to enjoy the view as well. And this is very important since innkeeping is very much about the lifestyle. The inn enjoys very strong year round income and offers the possibility of expanding the food service and retail shop for additional revenue streams.